Marijuana abuse is rapidly growing and currently it is the most common drug of abuse in the United States due to increased legalization for recreational and medicinal use. Delta 9-tetrahydrocannibol, the main psychoactive compound in marijuana, acts via the endocannabinoid system to elicit various cardiovascular physiological effects, and has been associated with many adverse cardiovascular effects such as acute coronary syndrome, arrhythmias, and sudden cardiac death that have previously been reported by our group and others. 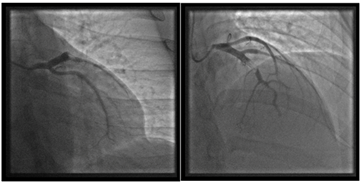 We present a case of a 30-year-old African-American male with no cardiovascular disease (CVD) risk factors with recurrent ST-segment elevation myocardial infarctions (STEMI) whose coronary angiography revealed recurrent 100% occlusion of the left anterior descending artery (LAD) in the setting of marijuana smoking. It was the patient’s third STEMI with 100% occlusion of the LAD with each STEMI secondary to thrombosis of a different region of the LAD. Marijuana use was confirmed by urine toxicology screening at each STEMI presentation. Coronary angiography on multiple occasions was negative for stenosis of other epicardial coronary arteries, and coronary calcium scoring was zero. Evaluation for other cardiovascular risk factors including family history of premature coronary artery disease, dyslipidemia, diabetes, and hypercoagulable disorders was negative. Further studies are required to elucidate the mechanisms of marijuana-associated coronary thrombosis and myocardial infarction. Center for Behavioral Health Statistics and Quality (CBHSQ). Behavioral Health Trends in the United States: Results from the 2014 National Survey on Drug Use and Health. Rockville, MD: Substance Abuse and Mental Health Services Administration; 2015. HHS Publication No. SMA 15-4927, NSDUH Series H-50. Gelfand EV, Cannon CP. Rimonabant: a cannabinoid receptor type 1 blocker for management of multiple cardiometabolic risk factors. Journal of the American College of Cardiology. 2006; 47: 1919-1926. Benowitz NL, Rosenberg W, Rogers W, et al. Cardiovascular effects of intravenous delta-9-tetrahydrocannabinol: autonomic nervous mechanisms. Clinical Pharmacology & Therapies. 1979; 25: 440-446. Bonz A, Laser M, Küllmer S, et al. Cannabinoids acting on CB1 receptors decrease contractile performance in human atrial muscle. Journal of Cardiovascular Pharmacology. 2003; 41: 657-664. Liu J, Gao B, Mirshahi F, et al. Functional CB1 cannabinoid receptors in human vascular endothelial cells. Biochemical Journal. 2000; 346 Pt 3: 835-840. Kanakis C Jr, Pouget JM, Rosen KM. The effects of delta-9-tetrahydrocannabinol (cannabis) on cardiac performance with and without beta blockade. Circulation. 1976; 53: 703-707. Beaconsfield P, Ginsburg J, Rainsbury R. Mariuana smoking. Cardiovascular effects in man and possible mechanisms. New England Journal of Medicine. 1972; 287: 209-212. Aronow WS, Cassidy J. Effect of marihuana and placebo-marijuana smoking on angina pectoris. New England Journal of Medicine. 1974; 291: 65-67. Wu TC, Tashkin DP, Djahed B, et al. Pulmonary hazards of smoking marijuana as compared with tobacco. New England Journal of Medicine. 1988; 318: 347-351. Korantzopoulos P, Liu T, Papaioannides D, et a. Atrial fibrillation marijuana smoking. International Journal of Clinical Practice. 2008; 62(2): 308-313. Lehavi A, Shay M, Gilony C, et al. Marijuana smoking and paroxysmal atrial fibrillation. Harefuah. 2005; 144(1): 2-3. Fisher BA, Ghuran A, Vadamalai V, et al. Cardiovascular complications induced by cannabis smoking: a case report and review of the literature. Emergency Medicine Journal. 2005: 22(9): 679-680. Baranchuk A, Johri AM, Simpson CS, et al. Ventricular fibrillation triggered by marijuana use in a patient with ischemic cardiomyopathy: a case report. Cases Journal. 2008; 1(1): 373. Diffley M, Armenian P, Gerona R, et al. Catecholaminergic polymorphic ventricular tachycardia found in an adolescent after a methylenedioxymethampthetamine and marijuana-induced cardiac arrest. Critical Care Medicine. 2012: 40(7): 2223-2226. Brancheau D, Blanco J, Gholkar, et al. Cannabis induced asystole. Journal of Electrocardiology. 2016; 49(1): 15-17. Hodcroft CJ, Rossiter MC, Buch AN, et al. Cannabis-associated myocardial infarction in a young man with normal coronary arteries. Journal of Emergency Medicine. 2014; 47(3):277-281. Mills B, Dishner E, Velasco CE. Acute myocardial infarction triggered by use of synthetic cannabis. Baylor University Medical Center Proceedings. 2018; 31(2):200-20. Ghannem M, Belhadi I, Zaghdoudi M, et al. [Cannabis and acute coronary syndrome with ST segment elevation]. Annales De Cardiologie Et D’angeiologie [serial online]. 2013; 62(6). 424-428. Velibey Y, Sahin S Tanik O, et al. Acute myocardial infarction due to marijuana smoking in a young man: gyuilty should not be underestimated. American Journal of Emergency Medicine. 2015; 33(8): 1114.e1-e3. Mittelman MA, Lewis RA, Maclure M, et al. Triggering myocardial infarction by marijuana. Circulation. 2001; 103:2805-2809. Caldicott DG, Holmes J, Roberts-Thomson KC, et al. Keep off the grass: marijuana use and acute cardiovascular events. European Journal of Emergency Medicine. 2005; 12: 236-244. Lee J, Sharma N, Saladini Aponte C, et al. Clinical characteristics and angiographic findings of myocardial infarction among marijuana users and non-users. Scifed Journal of Cardiology. 2017; 1(2): 1000008. Sulkowski A, Vachon L, Rich E. Propanolol effects on acute marihuana intoxication in man. Psychopharmacology. 1977; 52: 47-53. Alshaaraway O, Elbaz HA. Cannabis use and blood pressure levels: United States Health and Nutrition Examination Survey, 2005-2012. Journal of Hypertension. 2016; 34: 1507-1512. Wu TC, Tashkin DP, Djahed B, et al. Pulmonary hazards of smoking marijuana as compared with tobacco. New England Journal of Medicine. 1988; 318(6): 347-351. Lipina C, Hundal HS. Modulation of cellular redox homeostasis by the endocannabinoid system. Open Biology. 2016; 6: 150276. Singh A, Saluja S, Kumas A, et al. Cardiovascular complications of marijuana and related substances: A Review. Cardiology and Therapy. 2018; 7: 45-59. Quercioli A, Pataky Z, Vincenti G, et al. Elevated endocannabinoid plasma levels are associated with coronary circulatory dysfunction in obesity. European Heart Journal. 2011; 32: 1369-1378. Khouzam RN, Kabra R, Soufi MK. Marijuana, bigeminal premature ventricular contractions and sluggish coronary flow: are they related? Journal of Cardiology Cases. 2013; 8(4): 121-124. Rezkalla SH, Sharma P, Kloner RA. Coronary no-flow and ventricular tachycardia associated with habitual marijuana use. Annals of Emergency Medicine. 2003; 42(3): 365-369. Pacher P, Steffens S, Haskó G, et al. Cardiovascular effects of marijuana and synthetic cannabinoids: the good, the bad, and the ugly. Nature Reviews Cardiology. 2018;15(3):151-166. Dahdouh Z, Roule V, Lognoné, et al. cannabis and coronary thrombosis: what is the role of platelets? Platelets. 2012; 23: 243-245. Williams JC, Klein TW, Goldberger BA, et al. Δ(9)-Tetrahydrocannabinol (THC) enhances lipopolysaccharide-stimulated tissue factor in human monocytes and monocyte-derived microvesicles. Journal of Inflammation (London). 2015; 12: 39. Deusch E, Kress HG, Kraft B, et al. The procoagulatory effects of delta-9-tetrahydrocannabinol in human platelets. Anastheia & Analgesia. 2004; 99: 1127-1130. Randall MD. Endocannabinoids and the haematological system. British Journal of Pharmacology. 2007; 152: 671-675. Rodondi N, Pletcher MJ, Liu K, et al. Marijuana use, diet, body mass index, and cardiovascular risk factors (from the CARDIA study). American Journal of Cardiology. 2006; 98: 478-484.